Let's set the stage with some background. First, if you read this blog or related to me, you know I've been traveling a lot lately for my job. Next, if you live in the Philly area, you know that the weather has been terrible lately - overcast, rainy and cold - not really ideal birding weather. Lastly, if you are a birder, you know that this time of year can produce some really rare birds. All of these things came together last week in a big way. I have 2 projects going on for clients in the Bay Area of California. Both projects require me to meet with them in person but my calendar is booked solid for May with both work and birding. As luck would have it, the weather was so bad that I cancelled a trip to the shore last weekend and started to look at airfare pricing to California. Things worked out and I booked a last minute trip leaving Philly on Sunday, staying in Berkeley through Wed and catching the red-eye home on Wed night/Thurs morning. I had a few target birds to look for on this trip which I will post later. This post is about bonus birds - in particular a mega rare bird that I stumbled upon on my last day of the trip. The business part of the trip included a meeting with a client in Milpitas which is down near San Jose. The meeting was scheduled for 10 AM. How could I spend the morning? Hmmm. Birding of course. The night before, I searched eBird for a location close to my meeting that looked promising for shorebirds. 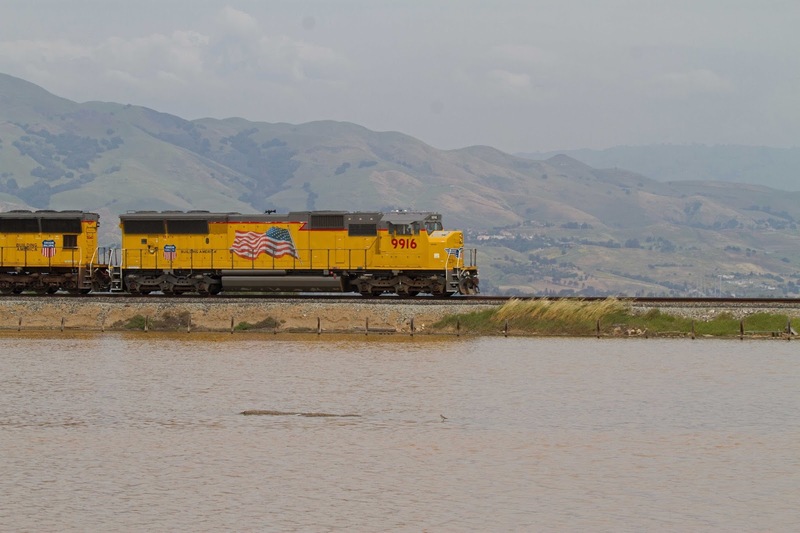 I clicked the link for Alviso Marina and was shocked to see Little Stint in the list of recently recorded birds. Now, you need to know that Little Stint is a super rare bird from Asia. 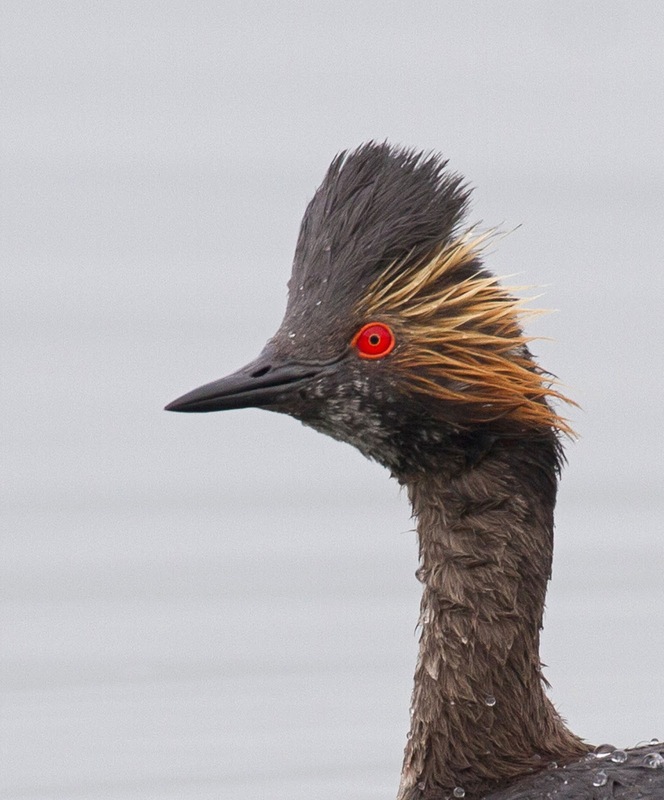 This bird was only the second ever recorded in all of California. I had to go. Arrived at 6:15 to find that the park doesn't open til 8:00 AM. That didn't stop me. Over the fence I went with my binoculars and camera. 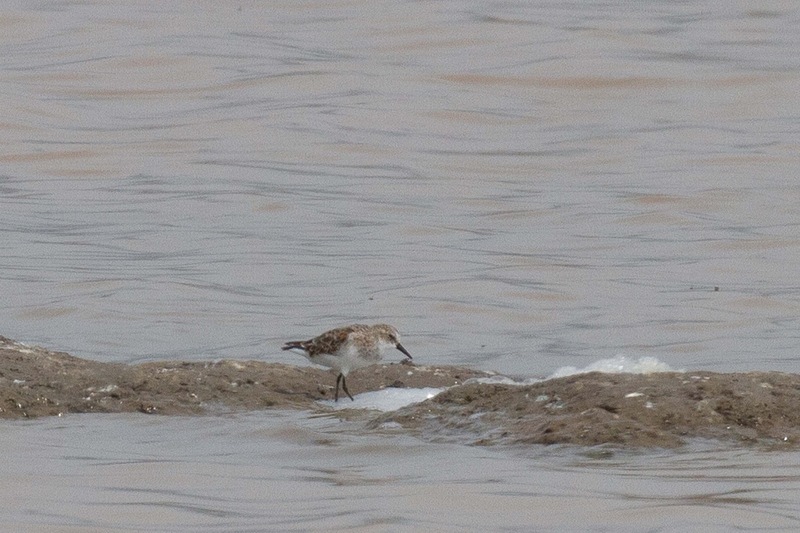 I was surprised that I was totally alone for 2 hours looking for the Little Stint. I thought for sure there would be others but only one other birder came along. We didn't find the Little Stint. 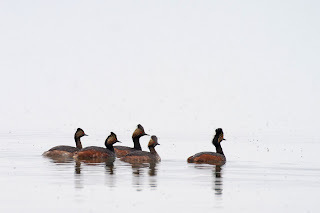 We did see these Eared Grebes floating on the glassy water. 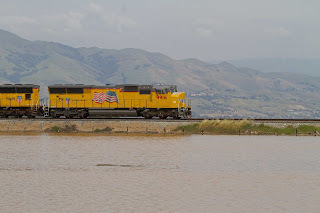 The sky was overcast and there was no wind which created a bright and smooth water surface. The grebes were not afraid of us at all. In fact, they dove under water and popped up very close to shore which allowed me to take these shots. 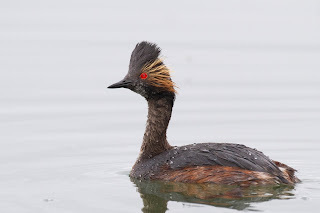 You can see why they are called "eared" with that yellow tuft of feathers but I think they could also be called "Devil-eyed" grebe due to that red eye or "Crested" grebe due to the crest that is always up unless they are getting ready to dive underwater. I am also a sucker for American Avocets. This location had a lot of them. They nest here and seem to be oblivious to people walking past them on the trail. I never realized that they had those shocking blue legs. One of the things that you might notice about all of these photos is that there are little black dots on them. This isn't a camera problem. The dots are tiny little flies that were here by the billions. So many that when I walked on the path, a cloud of them would rise up and fly around my feet to avoid being squashed. You can see it best in this photo. 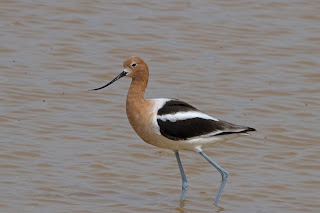 The Avocet is stalking the flies but they are too smart. 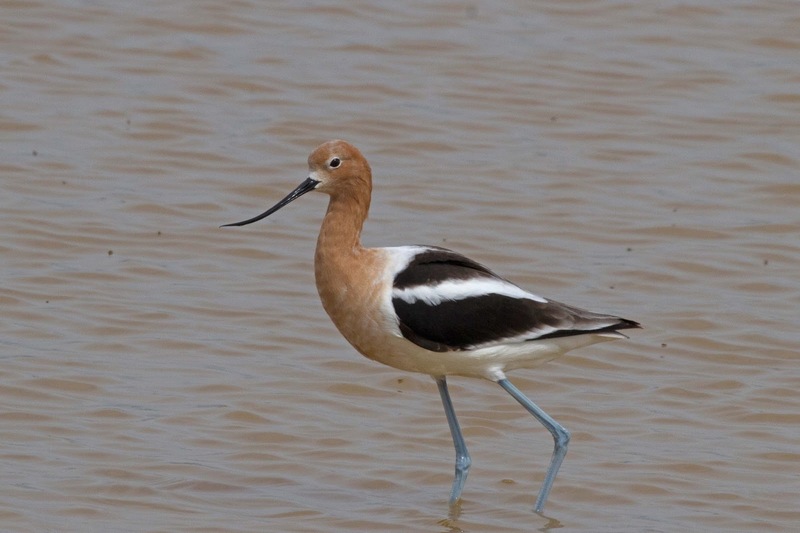 They move just far enough so the Avocet can't reach them. 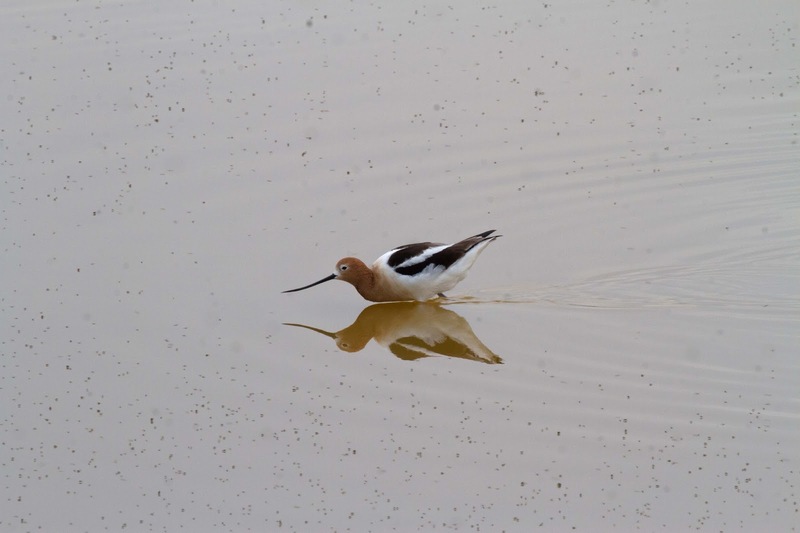 Obviously, the Avocet gets plenty of flies to eat but not in that photo. Here is another photo pocked with flies. 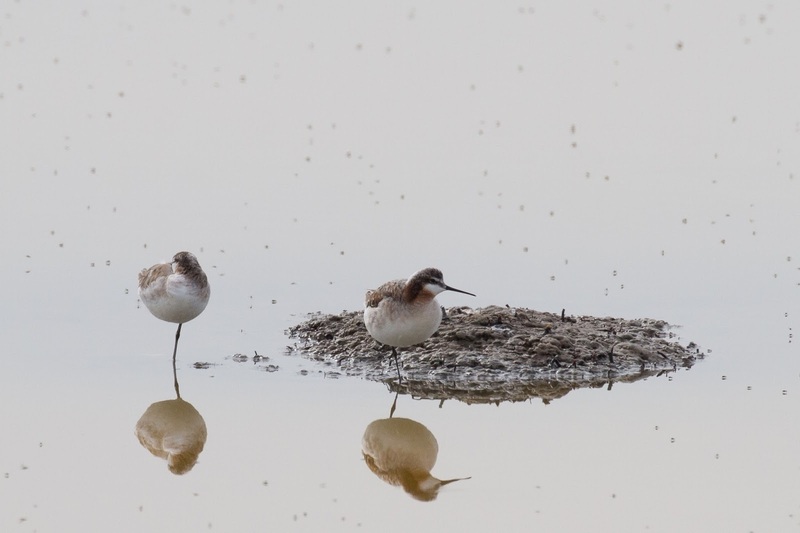 These are Red-necked Phalaropes. 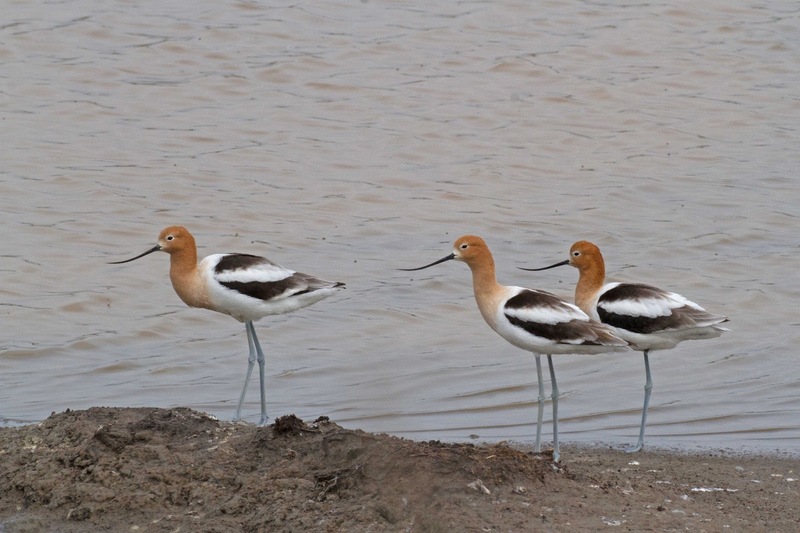 We usually see these birds in the ocean but they stop along the mudflats in migration too. Looks like they were taking a break from eating flies. The other birder told me that the Little Stint has been seen every day in the afternoon but not in the morning. Sigh. Why did I get up so early? Oh well, seeing Eared Grebes and Avocets made the trip worth it. But I had other ideas too. My meeting went great. I was supposed to be there until 4 PM but when I told my client about the rare bird, he agreed to cut the meeting short. So, I tore out of there at 2 PM and headed back to the park. This time, the gate was open and there were many other birders there. All gathered at the end of the trail where I had been searching for the Stint earlier. I literally ran to get there. Tada! Little Stint. I know it doesn't look like much after seeing the spectacular Eared Grebe and elegant Avocets but this bird is more sought after by far. 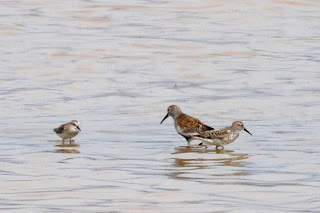 Here he is with 2 other species - Dunlin and Western Sandpiper. He chased both of these birds away from his little mud island. The other birders disbanded after awhile leaving me and one other lady there to watch this little lost bird feeding in the mud. The park is dissected by a train track which is very busy. Here is the scene. 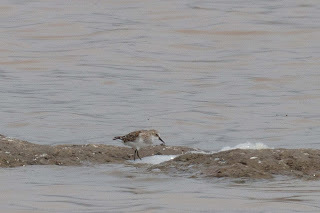 The Little Stint is there next to his island. A few other birds that were seen include this Short-billed Dowitcher. I know, "short billed"? 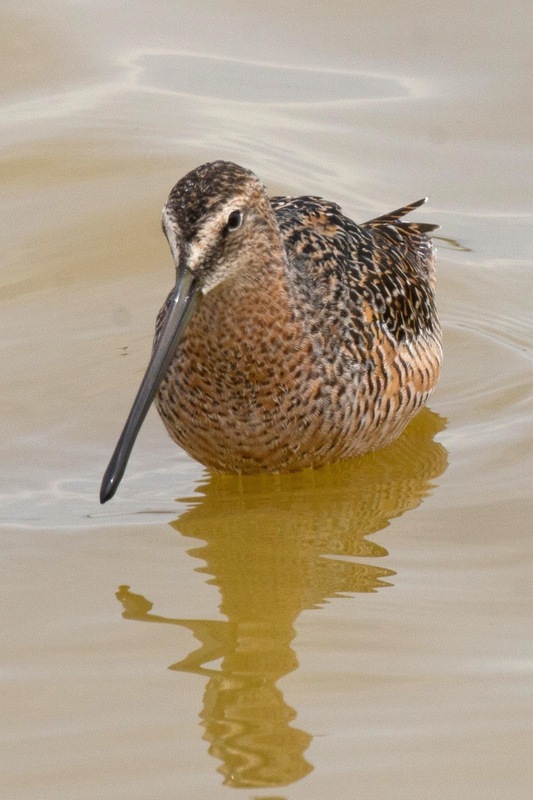 Believe it or not, there are also Long-billed Dowitchers. Imagine that. 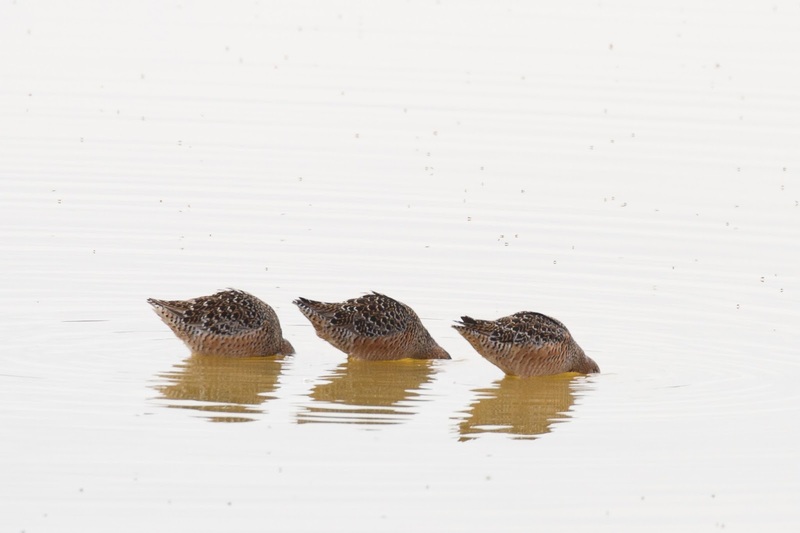 Here are a group of them poking their long bills into the mud below the water. 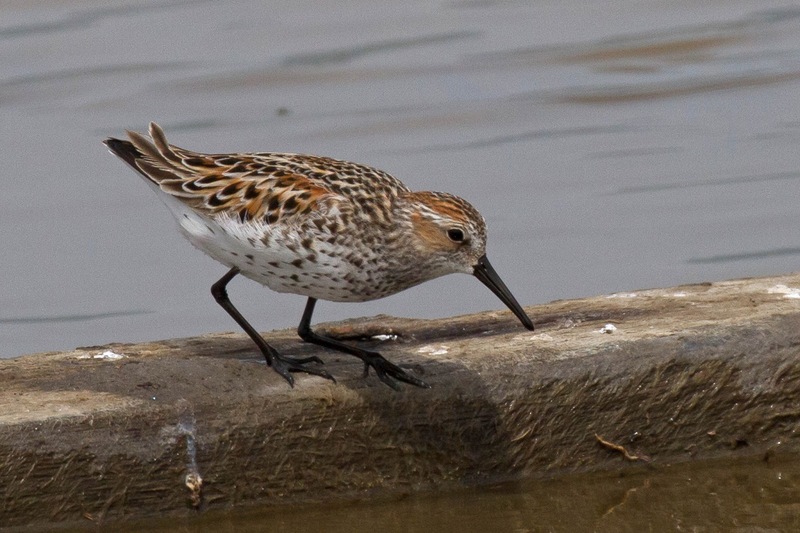 The most numerous species at this location is Western Sandpiper. Here is one getting ready to grab a fly from the water's surface. 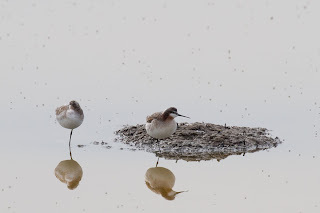 The Little Stint was icing on the cake for this trip. I'm glad I made the last minute decision. My clients are happy too. Now, back home to witness spring migration.